During the mid-seventies David Knopp started working with plywood as his medium. It was an accessible and inexpensive material to use in the self-trained process of stack lamination. It became an expendable resource to experiment with in creating forms. As his work progressed he discovered the linear strata inherent in the medium. Expressing movement with the “strata” became his aim. Knopp creates flowing liquid lines that engage the senses as the eye travels over the contours. A lifetime Baltimore resident, Knopp attended Essex Community College and Towson University. While studying life drawing, his focus was on the aesthetic qualities in the use of line. He carried this to another dimension and found a connection between drawing and sculpture. His process evolves with a daily routine of envisioning, refining, designing. It takes months to complete a work. In 2012 Knopp received the Mary Sawyer Baker Artist Award, which included an exhibit at the Baltimore Museum of Art. He was a recipient of Maryland State Art Council’s Individual Artist Award in 2012. In 2013 he was a semi-finalist for the Sondheim Prize. Since then he has been invited to exhibit work throughout Baltimore, DC and Philadelphia metropolitan areas. Knopp was accepted in juried exhibitions, including Craftforms 2011 through 2016, Living with Craft Invitational 2014, SOFA Chicago 2014 and 2016, Delaware Center for Contemporary Art 2013, 2014, and The Center for Art in Wood in 2016. 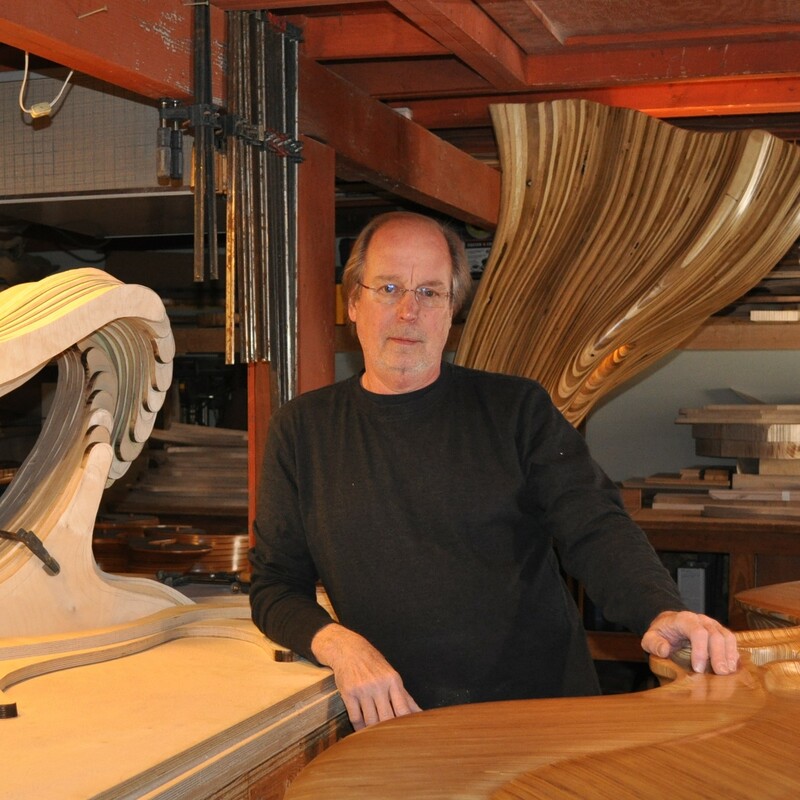 One of his sculpted chairs is in the permanent collection of the American Visionary Art Museum. My creations start with a vision and a rudimentary sketch. There are no defined templates, or 3D modeling software used. Every finished piece is one of a kind. I work primarily with various types of plywood. It’s a process of assemblage: cutting, gluing, clamping, and then cutting away. The beginning stage is an additive process of cutting varying segments of 3/4″ plywood and stacking them creating a step effect. The end grain is exposed, showing the strata of the plywood. 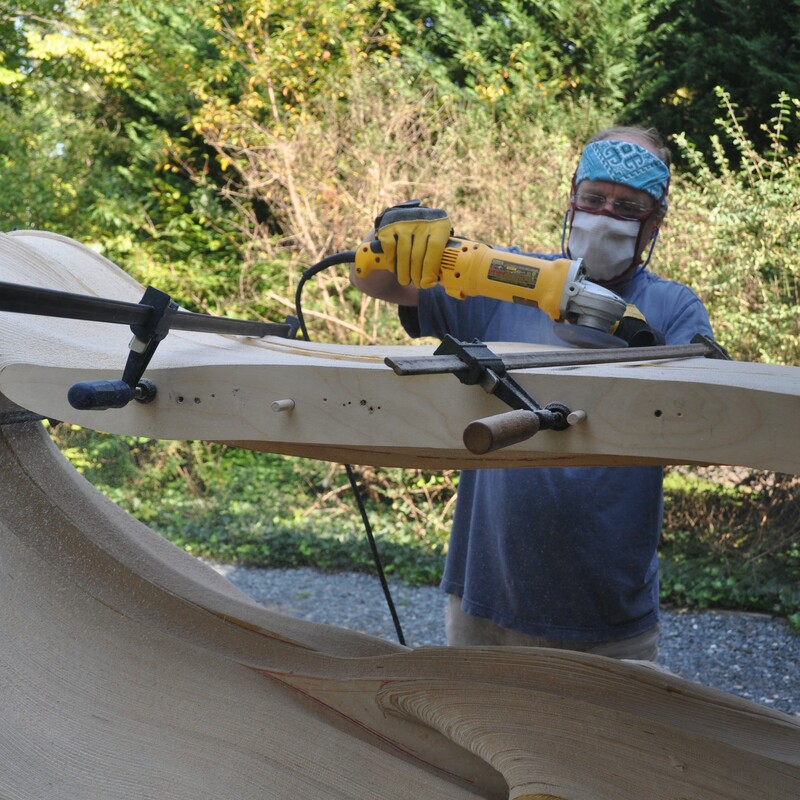 The individual layers are then glued and clamped together to form a rough solid form, which is then carved to its final shape. I use a variety of power and hand tools to carve and sand to achieve a finished surface. The final step is applying finish coats of polyurethane, tong oil, or paste wax. This emphasizes the contrast of the layers in the plywood, which become the lines that gesture movement within the piece. Without the restrictions of traditional woodworking, my tables evolve as functional sculptures. I can also push the limits of balance. The weight of the bases is what keeps the work grounded. I have always approached a work as sculpture not confined to design principles, such as “form follows function.” This allows the process to be a “creative effort” that can flow and represent my intentions. Using a self-trained technique, David Knopp carves plywood laminate into fantastically abstract shapes, imbuing the rigid nature of wood with the fluidity of water.